Droid X2 has more power and better graphics than its predecessor, but it still doesn’t offer a printed guide to its amazing features. 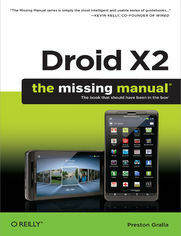 This Missing Manual helps you dig deep into everything Droid X2 can do. Learn how to shop, keep in touch, play with photos, listen to music, and even do some work. Unleash the power of this popular device with expert advice. Get organized. Sync Droid X2 with Google Calendar, Exchange, and Outlook. Go online. Navigate the Web, use email, and tap into Facebook and Twitter. Listen to tunes. Play and manage music using Droid X2’s Music app and Google’s Music Cloud Player. Shoot photos and video. View and edit photos, slideshows, and video in the Gallery. Stay productive. Create, edit, and store documents with Google Docs and Microsoft Office.